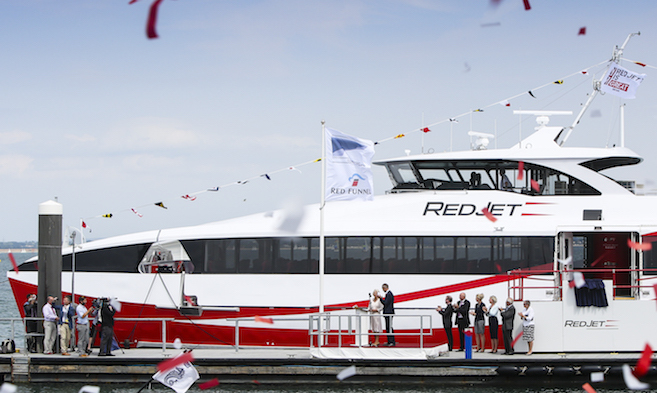 "The Isle of Wight welcomed a Royal visitor last week when HRH the Duchess of Cornwall was here for a number of engagements, including the naming of Red Funnel’s new Island-built fast ferry Red Jet 7 in Cowes," writes Capt. Stuart McIntosh. 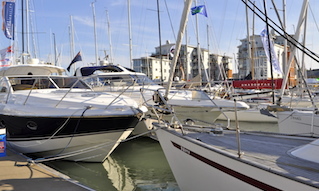 "The prestigious ceremony, held at Cowes Harbour Commission’s Trinity Landing, was attended by civic dignitaries, invited guests and members of the public, as well as 300 children from local schools. 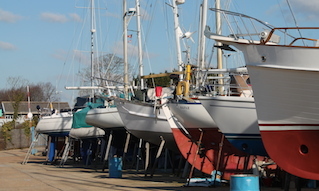 "It is Cowes Harbour Commission’s strategic policy to support marine employment on the River Medina and it is extremely encouraging to witness the resurgence of aluminium shipbuilding on the Island through companies such as Wight Shipyard and Aluminium Marine Consultants. The building of the Red Jet 7 in East Cowes by Wight Shipyard employed some 85 skilled Island craftsmen and several apprentices, sustaining local shipbuilding jobs, developing manufacturing skills and acting also as a showcase and potential catalyst for future marine industry contracts. "Meanwhile, congratulations are due this month to two of our Commissioners, Chris Preston, who is Commissioner for Stakeholder Relations and Nick Elderfield, who holds the Conservation and Environment portfolio. The RYA has recently appointed Chris Preston, who has over 50 years’ experience of racing and cruising, as the new Chair of its Board. Chris is looking forward to working with the RYA team to maintain momentum in meeting the future challenges of UK boating, and to supporting the Association’s membership throughout the UK in all areas of the sport. "Commissioner and Gurnard sailor Nick Elderfield was one of the successful crewmen onboard the Round the Island Race winning boat, High Potential . Despite the tricky conditions, the team on High Potential sailed an impressive race to win the top accolade, the Gold Roman Bowl, in 8 hours, 30 minutes and 3 seconds. 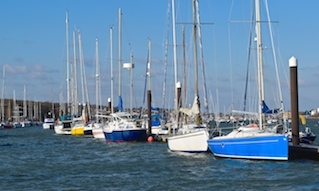 "Now the Harbour Commission’s focus is very much on Lendy Cowes Week that starts this Saturday, so may I encourage you to take a few minutes to read the relevant Notices to Mariners highlighted below, and let’s hope the continuing fine weather delivers those champagne sailing conditions that Cowes is renowned for."